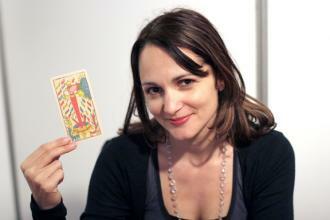 A fresh and contemporary approach to tarot reading Julia draws inspiration from modern day archetypes and well as ancient mythology. For Presentation, Julia prefers a classic business look for a day function or a cocktail dress for an evening function. Drawing upon her experiences in acting and theatre she is able to instantly break the ice and engage with people creating a friendly and fun environment. Usually a function would begin with a traditional sit down reading in a quiet part of the room, later Julia introduces ‘Walk around Tarot’ which works as an interactive game and encourages guests to laugh and read together in a team environment. Gifted in general clairvoyance Julia also incorporates this into her general readings. Events with children – a special fairy story deck is used with images such as Sleeping Beauty individual readings and interactive games can be organised. Well experienced with children Julia has also taught drama at Sydney’s Scots College. Many costumes available eg. Burlesque, 1920’s, circus and so on.